Acidity or Heartburn is another source of discomfort for some pregnant women. It can make you feel uneasy with a burning sensation in your chest, or make you feel nauseous if it is really severe. You might feel the urge pop up an antacid, but what you actually need is plenty of water, a good nutritious diet and a relaxed mind, free from hustle and bustle of daily life. 5 tips to ease heartburn in third trimester. 1. Try to have 5 to 6 small meals during the day. 2. Drink more water (at least 8 glasses in a day). 3. Avoid spices and oily foods. Opt for non-fried snacks. 4. Have 2 to 3 glasses of buttermilk daily if you can handle. Alternatively sip on juices and shakes. 5. Include a lot sprouts in your diet. They are alkaline by nature and help to avoid acidity. Along with these tips, work on soothing your body and mind for this is the best medication you can prescribe yourself. The best drink to have when you are suffering from a heartburn is Mint Chaas which is also very nutritious because of its protein, calcium and phosphorus content to help in the development of your growing baby. Another hearty beverage that you can have is Lettuce and Cauliflower Soup to soothe your tummy. It is a thick and creamy soup prepared without milk, thickened using finely chopped cauliflower, which not only imparts a creamy texture but also balances the flavour of lettuce well. Watermelon and Coconut Water Drink where watermelon is used and is a cooling fruit, this drink is made even better by the addition of coconut water, which is effective in balancing the stomach acids. Recipes like Sprout and Fruit Bhel help in relieving heartburn when you are hungry during snack time. This is an excellent snack with a good combination of sprouts and fruits providing you with vitamins and fibre. Make puris using cereals like wheatflour, jowar, ragi or legumes like moong dal, chana dal such as Baked Methi Puris and Mini Baked Moong Dal and Jowar Puri which are great to be had during snacks and give you the required energy and protein boost. Dal and Vegetable Idli are quick and easy to make. They are nutritious because of the combination of 3 dals and vegetables like methi, green peas and carrots. These are great for an early pregnancy boost and being an excellent source of iron, fibre, folic acid and vitamin c, they will ensure that you and your baby get plenty of goodness. 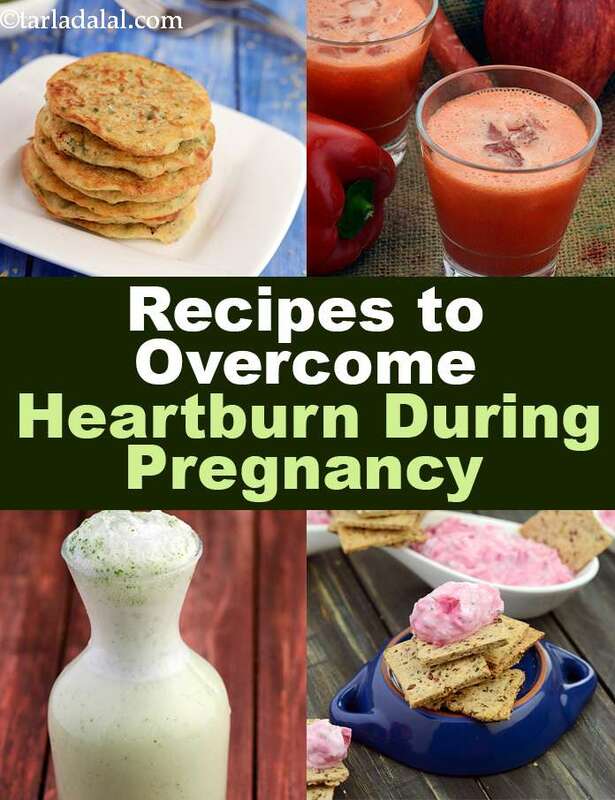 Enjoy all our recipes to overcome heartburn during pregnancy. Explore more varieties in our pregnancy section everyday.